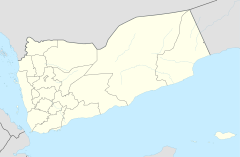 A munitions factory explosion took place on March 28, 2011, in the village of Khanfar, Abyan, bordering the town of Jaʿār in Abyan Governorate, southern Yemen. The explosion occurred during a period of high insurgency from rebel forces and Islamist movements in Southern Yemen, in addition to an ongoing government crackdown on al-Qaeda. Following clashes near the town of Jaʿār, the Yemeni Air Force bombed the area earlier in the day of the explosion. During the same day, President of Yemen Ali Abdullah Saleh announced an end to government concessions given amidst ongoing protests in the country, although it was not immediately known whether the explosion was connected to the protests. The blast occurred a day after around 30 armed al-Qaeda militants raided the "7th of October" ammunition plant in the town, stealing cases of ammunition and leaving gunpowder exposed at the site; militants took over another nearby munitions factory in Khanfar. According to Al Jazeera, the initial fire was reportedly triggered by a local resident dropping a lit cigarette while inside the looted factory, as some were checking the site for weapons, which soon led to an explosion. It was loud enough to be heard roughly 15 km (9.3 mi) from the factory, and left many charred bodies at the scene. Estimates of the number of casualties were not immediately clear. According to the BBC and AFP, 78 people died in the explosion, while The Independent said that "more than 100" people died, and CNN said that "[a]t least 121" were killed. By the day after the incident, the death toll had been increased to 150. An accurate death toll was reportedly difficult to establish, due to the condition of the bodies, many of which were badly burned. 45 people were reported injured, 27 of whom were, according to officials at a local hospital, in critical condition after the incident. Some of the injured were taken to Jaʿār for treatment, while others received treatment at a hospital in Aden. Abyan's Deputy Governor Saleh al-Samty placed blame on the national government for creating a lack of order in southern Yemen caused by heightened security countrywide. The Joint Meeting Parties opposition group (JMP) blamed the incident on government military withdrawal in the south. ^ a b Jazeera, Al (28 March 2011). "Scores killed in Yemen arms factory blasts". Al Jazeera. Retrieved 29 March 2011. ^ a b c "Yemen: Blast Kills 110 In Arms Factory Raid". Sky News HD. March 28, 2011. Retrieved 29 March 2011. ^ "Yemen: Blast Kills 150 In Arms Factory Raid". Sky News HD. March 29, 2011. Retrieved 29 March 2011. ^ Almasmari, Hakim (March 28, 2011). "Blast at Yemen Munitions Plant Kills at Least 124". The Wall Street Journal. Retrieved 29 March 2011. ^ a b c d al-Haidari, Fawaz (March 28, 2011). "Blast at Qaeda-looted Yemen ammo plant kills 75". Agence France-Presse. Retrieved 29 March 2011. ^ Salama, Vivian (March 28, 2011). "Saleh Rules Out More Concessions, Says Yemen Is 'Time Bomb' Near Civil War". Bloomberg. Retrieved 29 March 2011. ^ Staff, Bikya Masr (March 29, 2011). "Yemen factory explosion kills 78". Bikya Masr. Archived from the original on 29 March 2011. Retrieved 29 March 2011. ^ "Abyan Explosion Kills Scores". National Yemen. March 28, 2011. Retrieved 29 March 2011. ^ Lu, Hui (March 28, 2011). "Death toll in Yemen ammunition factory blast rises to 70". Xinhua. Retrieved 29 March 2011. ^ a b "Yemen weapons factory hit by deadly explosions". BBC News Online. 28 March 2011. Archived from the original on 29 March 2011. Retrieved 28 March 2011. ^ "Accidental explosion at Yemen arms factory kills 100". The Independent. 29 March 2011. Archived from the original on 29 March 2011. Retrieved 29 March 2011. ^ a b "Ammo factory blast in Yemen kills at least 121". CNN. 28 March 2011. Archived from the original on 29 March 2011. Retrieved 29 March 2011. ^ "Yemeni arms factory blast toll rises amid protests". BBC News Online. 29 March 2011. Archived from the original on 30 March 2011. Retrieved 30 March 2011. ^ al-Haj, Ahmed (March 28, 2011). "Blast at Yemen explosives factory kills 110". Salon. Retrieved 29 March 2011. ^ Kasinof, Laura; Robert F. Worth (March 28, 2011). "Blast at Factory Follows Yemeni Forces' Pullout". The New York Times. Retrieved 29 March 2011.